When we arrived yesterday at Tel Aviv airport, I soon realized that taking pictures in Israel wont be a straightforward job. Before officially entering the country, the boarder guard asked me to delete all images on my digital cam, after he understoud that I tried to make a photo of him. Therefore today on the beach near Jaffa I used the camera with more caution, in particular when a large group of tourists fro m the West-Bank came to enjoy a day at the seaside. I found this Jaffa variant of Baywatch much more inspiring and beautiful than the original. 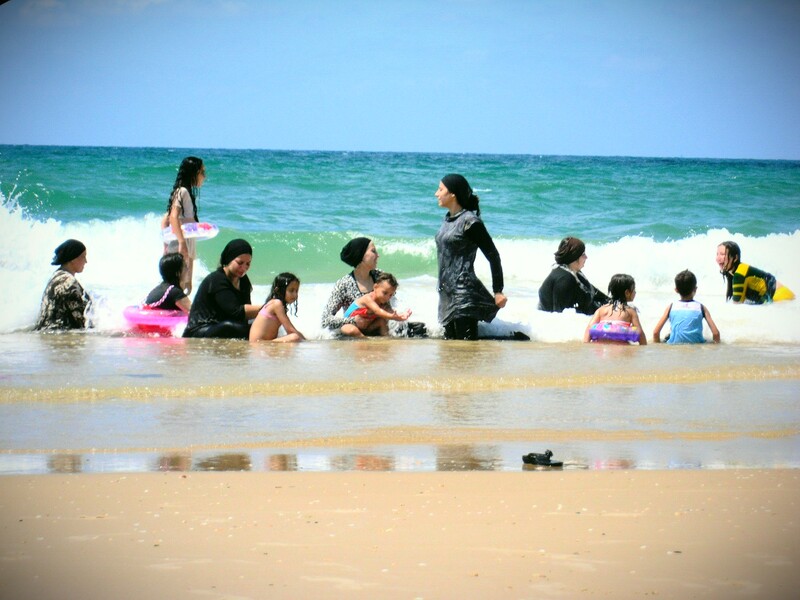 Mostly Hijab clad Palestinians from the West Bank enjoy the Tel Aviv beach of Mediterranean Sea on the last day of the Eid-al-Fitr festival, marking the end of their holy fasting month of Ramadan August 21, 2012). Tens of thousands of Palestinians visit Tel Aviv and other places in Israel after Israel granted travel permits to West Bank Palestinians for the first time since the year 2000. I do not evеn know how I ended up here, but І thought this post was good.